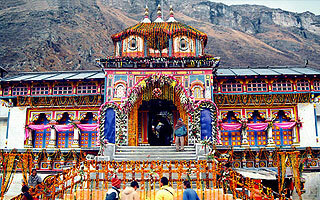 Char Dham yatra to Yamnotri, Gangotri, Kedarnath & Badrinath in Uttarakhand is one of the most pious pilgrimage in India. This yatra starts every year from last week of April or starting week of May till October-November each year. Along with the religious importance a travel to these destinations also provide a beautiful view of Himalyan Mountain and its peaks. At airport/railway station our representative will welcome you with heartfelt hospitality. After introduction, drive to Haridwar. On the arrival at Haridwar, check-in to the hotel and get fresh. To have lovely evening you can visit some nearby locations. Some places to visit are Harki-pauri, Mansa Devi temple and Bharat Mata Mandir. Your evening in the region will be an unforgettable moment in life. In the evening you will experience some ritual possessions in the Ganga River. Witness the Hanga Aarti and experience the religious and spiritual values. After breakfast, get ready for drive towards Barkot via Dehradun and Mussorie. On the arrival at Barkot, check-in to the hotel and relax. Overnight at hotel in Barkot. After breakfast, get ready to drive towards Janki Chatti. Janki Chatti is such a place overflow with natural beauty. The region is 50 kilometres far from Barkot. From Janki Chatti your journey will move towards Yamunotri. 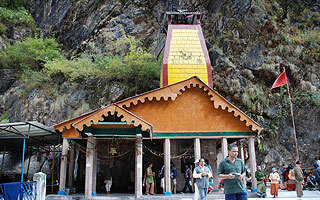 To reach Yamunotri, you can go by horse or by Doli. The charge for the service is not covered in the tariff. After a few hours, you will be at Yamunotri. On the arrival at religious site Yamunotri, one can cook rice by packing rice in a cloth and dipping in the hot water of the sacred hot Kund. Devotees offer the cooked rice to goddess and take home as Prasad. In the sacred site, you will get a chance to participate 'Pooja'. The Pooja is offer to Divya Shila. After breakfast, check-out from the hotel and ready to drive towards Uttarkashi. On the arrival at Uttarkashi, check-in to the hotel. After breakfast, get ready to go for an excursion to Gangotri. On the arrival at Gangotri, you will explore the religious place of worship. 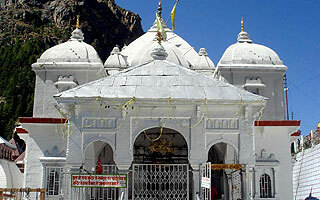 Gangotri is one of the sacred places of worship for Hindus. On the arrival at the sacred place, you will take a holy dip in the sacred Ganges River. Gangotri is also called as the Bhagirathi and its origin. Visit the temple and offer prayer to have a blissful life. After breakfast, get ready to visit Kedarnath. On the day, you are going to enjoy thrilling experience of your Char Dham yatra. You will visit the religious site Shri Kedarnath through Helicopter. The service of helicopter starts from Phata. 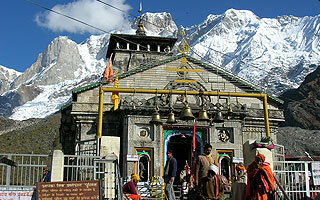 Kedarnath is one of the most sacred places of worship for your pilgrimage. In Kedarnath, you will first have Darshan in Shri Kedarnath Ji Temple. You will also visit the Samadhi of Adi Guru Shri Shankracharya Ji. Visit all the places located in and around the temple. Scenic beauty and pleasant environment will surely hypnotize your attention. After breakfast, get ready for journey towards Badrinath via Joshimath. On the arrival at Badrinath, check-in to the hotel. Get fresh and ready for sightseeing. For sightseeing, you will take to following places by tour guide. Fantastic places to visit are Bhimkund, Mana, Vyas Gufa, Charanpaduka, Maatamoorti and the Mukh of the Saraswati River. All these locations are located with 3 kilometres of Badrinath. In early morning, after bath in the Tapt Kund you have to go Badrivishal for darshan. Brahamakamal is one of the significant places for Pinddan Shraddh of Pitrus (ancestors). After breakfast, get ready for drive towards Rishikesh. On the arrival at Rishikesh, check-in to the hotel. 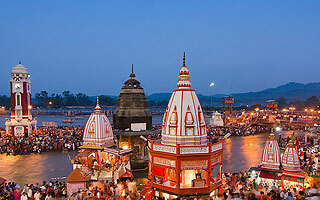 In the evening, you will visit the Laxman Jhula, Ram Jhula, Swargashram and Triveni Ghat. Explore all the locations with great fun and entertainment. After breakfast, get ready for check-out and drive to Delhi. Here your tour ends, our representative will transfer you to Railway Station/Airport for further journey. Expenses caused by factors beyond our control like rail and flight delays, roadblocks, vehicle, mal-functions, political disturbances etc. on. Note: The tourism infrastructure in Chardham Sector is not very developed and one should not expect or compare it with the standards of plains & other developed destinations. There is always scarcity of water and power in the region and so you might come across situation like water (hot) being supplied on time basis – morning & evening.